Celebrate Women is CFUW Sudbury's signature event. It was created in 1996 in partnership with the YWCA Sudbury and the Women's Legal Education and Action Fund. This highly successful annual fundraiser features a Canadian female author who reveals her experiences as the author of her latest book. An organizing committee is struck to ensure that all who attend enjoy a stimulating evening and have an opportunity to meet the author. CFUW Sudbury's share of proceeds assists in providing bursaries and scholarships to deserving students. Celebrate Women raises money through three methods - ticket sales, books sales and book sponsorships. For a $100 contribution, a copy of this year's book will be placed in a secondary school, post-secondary, or public library of your choice, and your support is recognized with a dedication in the book. Individuals, groups, and businesses often choose to honour or remember friends, family, and colleagues in this way. Tax receipts for the full amount will be issued by the YWCA. ​Click here to download the book sponsorship form. Celebrate Women 2019 is Wednesday, May 1st! 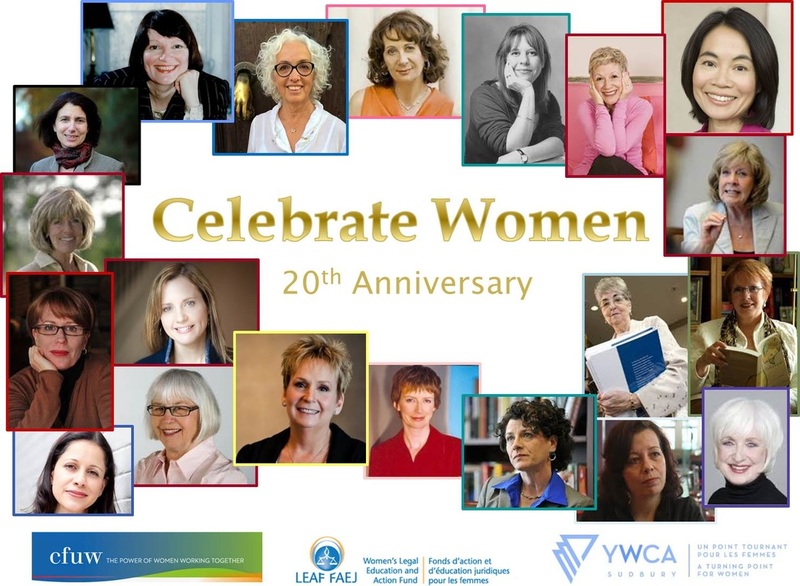 Celebrate Women 2020 will mark our 25th year. Click here to download the presentation as a .pdf file.